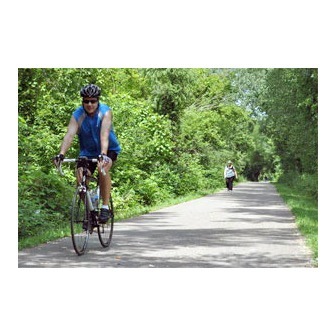 The Douglas State Trail is a paved 12.5 mile, multiple use trail developed on an abandoned railroad grade. This trail crosses outstanding rural scenery, traversing some of the richest agricultural land in Minnesota. The trail begins in northwestern Rochester, travels through the small town of Douglas (for which the trail is named) and terminates in Pine Island. It is generally level and wheelchair accessible. This trail crosses outstanding rural scenery, traversing some of the richest agricultural land in Minnesota. You will pass through a scenic mix of forest, rolling fields and pastures. Partridge and pheasant live in the woods, and toward Rochester, geese become more abundant. Little-used county roads offer opportunity to plan a circular route. One treadway is paved for bicyclists, hikers, in-line skaters and skiers. A second treadway has a natural surface for horseback riders and snowmobilers. You will need a horse pass if you will be horseback riding, a ski pass for cross-country skiing, and a snowmobile state trail sticker for snowmobiling. No other fees or passes are required to use the trail. Address: 2300 Silver Creek Rd NE.